Nintendo Switch is in stock on Amazon right now – go, go, go! When Amazon gets Switch consoles back in stock, inventory typically lasts for about 20 minutes at most. That means you have about 10 to 15 minutes at most to score one. 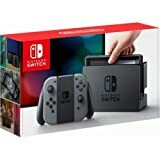 That’s right, the Nintendo Switch with Gray Joy-Con is in stock on Amazon at this very moment at it’s regular MSRP of $299.99. Only Prime subscribers can buy the hot new Nintendo console, so hurry up and sign up for a free 30-day Prime trial if you’re not already a member. What are you waiting for? Go, go, go!